"American Girl doll clothing and more"
Go to some of the doll shows, talk to the collectors, find out what they want. Have samples of your products and always a business card. The hand made items are far more superior than the clothes you find in stores. Offer them specialty items. They may want certain colors, styles and costumes. 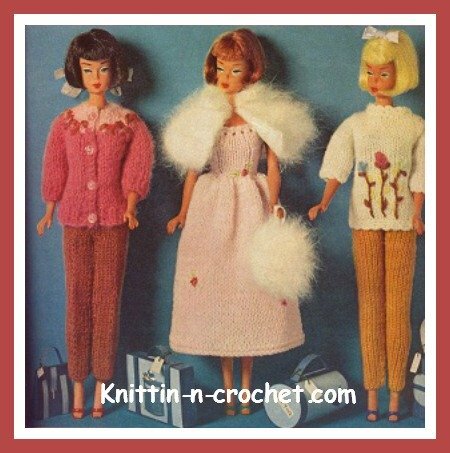 If you are interested in the doll clothes niche these are just some ideas to get you to brainstorming. Take your time and do some investigating. You will find a whole miniature world out there and you may be able to fill and void and create a home business for yourself. The American Girl Doll is fun to create for your doll clothes niche because you can make her up in any era you choose. 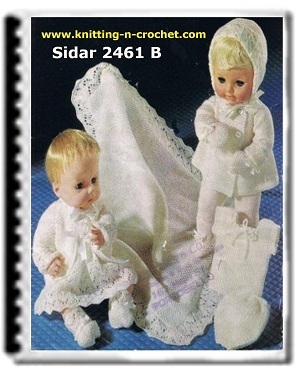 There are many collectors that are always looking for quality made clothes for their dolls. This doll clothes set is sweet and easy to make. 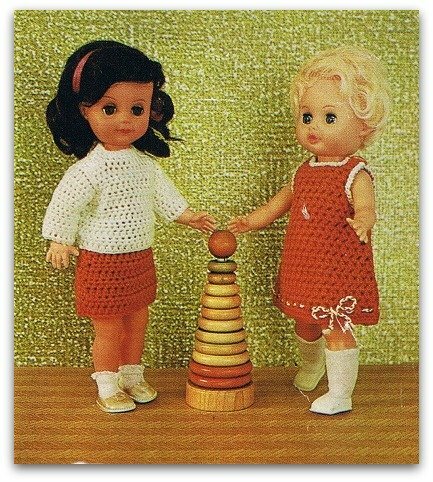 It goes to show you little girls have enjoyed their dolls through out the decades. I like collecting patterns for knit and crochet. I hope you enjoy this pattern. Whether you are trying to build a business or making this pattern up for your daughter have fun. Try some different colors, yarns and such. 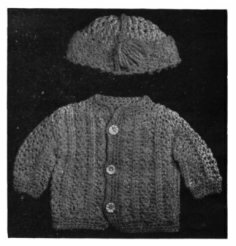 This pattern was taken from "Handbook for Wool Knitting and Crochet" in 1918. 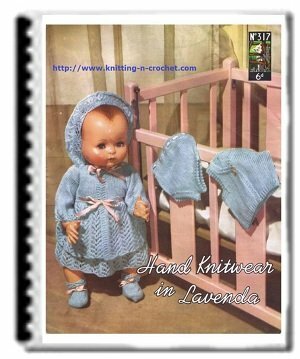 Using vintage patterns is ideal and allowed for your doll clothes niche. Do not use any patterns after 1965 without permission. This pattern is from the book "Handbook of Wool Knitting and Crochet"
The creator is anonymous. The book is in the Public Domain and can be downloaded in its entirety from Project Gutenberg One skein of white and blue Saxony will be sufficient for two sets; use a crochet-hook that will carry the wool easily. Commence the sweater with a chain of 60 stitches. 1. A double in each stitch of chain, turn. 2. A treble and a double in back of double of last row (chain 3 for 1st treble of the row), miss 1 double; repeat to end of row, turn. 3. A treble and a double taken between treble and double of last row; repeat. 4. A double in back of each stitch of last row (chain 1 for 1st double). 5. Same as 4th row. This completes the portion over the shoulder. On one half the length repeat the 2d, 3d, 4th, 5th and again the 2d row which completes one front. Work in the same way on the other half of length, which brings you to the center of the back and makes half of the sweater. Make the other half to correspond, and join neatly down center of back. Fold and join under the arms, making the arms of desired size. For the sleeve: Make a chain of 15 stitches, and repeat from 1st to 5th row; then repeat from 2d to 5th row twice, and join last row to 1st; also crochet sleeve in the arms. Entirely around the sweater make 4 rows of double crochet with blue yarn, working in both veins of stitch to avoid a rib, and putting 3 stitches in 1 at corners to turn smoothly. After working 2 rows of left front make the buttonholes, separated by 8 doubles, by chain 3, miss 3; then in next row make a double also in each stitch of chain. Finish bottom of sleeves in same way, missing every 2d stitch in 1st row to draw in the cuff a little. Sew on pearl buttons to match the buttonholes. Cap: Chain 5, join to form a ring. 1. Chain 3, (yarn over hook, insert hook in ring, take up yarn and draw through) twice, yarn over and draw through all the loops on needle, chain 1 to close the “bean,” make 6 more bean-stitches in ring, and join to top of 1st. 2. Chain 3, and make a bean in top of each of last row, and between each 2; join. 3. Chain 3, a bean-stitch between each 2 of last row, widening every 3d or 4th by making a bean in top of bean. 4, 5. Same as 3d row, widening every 5th bean, or as necessary in order to keep the shape. Make 5 more rows without widening, which completes the body of cap. For the border, turn cap wrong side out and tie in the blue yarn, working on the wrong side to form the band so that it will turn up on the right side. 1. Chain 3, draw a loop through 2d and 3d stitches from hook, also through next 2 stitches of last row of cap, * take up wool and draw through all the stitches on needle, chain 1 to close the star, draw up a loop through eye of star last made, under the 1 chain, another through back part of last loop of preceding star, and 2 loops in next 2 stitches; repeat from *, and continue until you have made 4 rows of star-stitch. Fasten off neatly. Make a tassel of the colored (blue) yarn, and attach to top of cap by a crocheted cord. 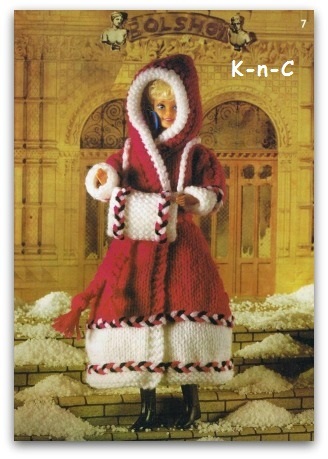 Don't forget the charities, there are many little girls out there that would love a new set of clothes for their dolly.